Here are just a few of the bunnies who have been adopted from AAORR. Born: Approx 2-3 years of age. Age: Approx 1 yr ate time of intake. Is this rabbit good with other animals? : With proper introductions, Carl would be fine! Age: Approx 8 mo to 1 yr. at time of intake. Age: Approx 2 years old at date of intake. Born: Approx 2 years at intake. Age: Both aprox 4 - 5 years old. Age: Aprox 9 weeks old when he came to us. Date Adopted: January 12, 2013. 6 week old female bunny!!! !for free!!!! I have a 6 week old bunny that I am giving away. She is white and gray and fluffy she is really cute and sweet. She is used to be handled by children and does not bite. She eats rabbit pellets, lettuce carrots grass and any kind of green veggies. I want her to go to a good home and be well taken care of. This ad was brought to our attention so we contacted the lady to warn her that such young baby buns listed for free can go for snake food or worse, to which she immediately scoffed and said that she didn't really care where the rabbit went, it was a first come, first served situation. We immediately offered to go pick her up and they mentioned that if someone else got there first they were not willing to hold her for anyone, so we rushed over to get her. She was in a small aquarium with her father (Her mother was out wandering the lawn with the young boy) with no hay, a small bowl of Wal-Mart pellets and an old, bruised apple. We immediately picked her up and left. We learned from a few other people that knew of the place that there were more rabbits in the basement that were breeding out of control in bad conditions, so we called the Humane Society and gave them her information. We brought young Nermal to her foster home the next day and after a few days, her foster family fell head over heels for the little baby, so the decision was made for them to keep her. Jasper, Tiana and Kia were all three surrendered from a family that had a litter of babies for Easter, and did not want to go through the troubles of raising the babies and getting rid of them when they realized raising bunnies wasn't what they thought it was. So they gave them to us at 4 weeks old. Luckily, by being very careful with their diets, they all survived and have been doing very well. Jasper was adopted by a wonderful family who spoils him. He is on the timid side but is quite sweet and a healthy boy. He is now happlily bonded with Nermal. Jasper was a surrender that was brought to us by a lady and her boyfriend that no longer wanted him. He was being poorly fed and due to this, he was underweight and had flaky skin due to malnutrition. Despite this, Jasper was extremely bright eyed and happy, loving attention and cuddles. Jasper was adopted out once but after a few months, returned because the girl needed to move. He came back in decent physical condition, but extremely depressed and not nearly as happy as he had been. We concluded that he must have been ignored and left to sit in his cage, thus leading to boredom and depression. Jasper bounced back very well though, and is once again a very happy bunny. While we were on our way home from one of our further events, we stopped by and picked up Ashton and Spyro. Ashton is an extremely cuddly and would completely relax in the arms of whoever held him. He loved following people's feet and just begged attention at every turn. He was adopted by a wonderful family who completely spoils and adores him. Daisy was a surrender from a family that had gotten bored with her and no longer wanted her. When she came she had been on a diet of nothing but carrots for a few days since they knew we were going to pick her up and did not want to spend the extra money on food for her. She was quite hungry and her poop was literally orange, although she was quite overweight. She stayed with us for a bit before going to her foster home. She stayed there for months without any interest and soon enough, she went to a new foster. Daisy is a very sweet bunny, but timid with strangers and quite unsure of herself, hiding in new surroundings and hesitant to approach people. She did gain confidence over her stay with her fosters and after plenty of cuddles and attention, grew a lot friendlier and got her down to a healthier weight with good pellets, hay and a variety of healthier vegetables. Lucy was a surrender from a lady who was moving into a home that did not allow pets and she could no longer keep her. She was kept in a cage where, instead of cleaning her regularly and giving her a litter box, they simply kept piling new Carefresh on top of the old, resulting in layers upon layers of old, soiled bedding. Lucy is an extremely clean rabbit who benefited highly from having a litter pan. She originally came with the from BC where she was adopted from the SPCA. She was a seizure from a home that was unsuitable with her sister, so one can only imagine the conditions she was once kept in. While Lucy is quite sweet, she is territorial and has been known to bite on those who come into her space too quickly or make sudden movements, so finding her a good, responsible home that is used to being patient with rabbits was a must. Thankfully, Lucy found the perfect home (Where she was renamed "Bunnita") and is a hopeful bondmate to another rabbit named Bunnerkins. She is free roam of a room so it helps the problems of being territorial greatly. We received a call from a family that had a neutered Holland Lop named Simba who was needing a new home. Apparently he was in a cage in the laundry room and was not allowed to leave due to the family dog, who had a high prey drive and would go for the rabbit if allowed to see him. They also supposedly had allergies that prevented them from spending too much time with him, so Simba was restricted from seeing anything other than the lonely laundry room. Simba, renamed Muggle while he was with us, was a very friendly, active and curious rabbit who liked people but did not like being handled. He was a very handsome boy and it did not take long for him to be adopted. He did not get to be with his new family long, however, as he was humanely euthanized at the vets due to a blockage. The family had gotten him a bed and did not notice in time that he had chewed a small hole in the bottom of the bed and had been eating the stuffing. By the time this was discovered, it was too late and he was, sadly, put to sleep. Thumper was a surrender from a former rabbit hopping club member who was no longer allowed to attend. She and another member had been allowing their rabbits to breed, resulting in Thumper having back to back litters. This was very hard on poor Thumper's system and affected her greatly later in life. Buttercup, Thumper and Skittles were all surrendered at the same time when the Mother of the girl who had the rabbits decided she no longer wanted them. For years the three rabbits had free roam of the back yard and commonly escaped, often found wandering the neighborhood. During the summer they survived off of grass and fruit, while in the winter they lived off of an abundance of fruit and Beneful dog food. When the family decided that they no longer wanted the rabbits "destroying their yard", they built a small enclosure for the three rabbits out back and fed them fruit and dog food, resulting in them becoming extremely overweight and unhealthy. Finally, the parents posted on Facebook that they were planning on donating the rabbits to a local petting zoo. One of us were still friends with her on Facebook and saw the posting, in which we immediately volunteered to take the three rabbits in. Thumper had old injuries from being attacked by something that resulted in her having a very odd hopping gait. Due to her age as well as health history, we decided to adopt her out without having her spayed since the odds of her making it through the surgery were poor. Despite all this, she was a very sweet and happy rabbit who loved people. She lived for a few months with her new family before passing away. Babbitty Rabbitty was our very first rescue bunny that we decided to keep. He came from a breeder who decided that, despite being "confirmationally correct" and suitable for a show table, he simply had too much energy for her liking and decided that culling him would be more suitable. She had a cage in her breeding shed that she placed cull rabbits into that were suitable for snake food. The UPS delivery guy used her to stock food for his boa constrictor, so if he went in the back yard and saw rabbits in that cage, he knew he could take them and use them for food. Babbitty and Somebunny were two of those rabbits. A friend of ours was looking for a bunny and since we knew her as an acquaintance, she offered up these two culls for her to pick from and the other could return to her. We knew taking these two buns that neither of them would be going back. Our friend picked Somebunny, and Babbitty wound up staying with us. Babbitty is the most amazing rabbit I have ever met, extremely sweet and unbelievably social. He does have ongoing medical problems (Ear problems, back teeth problems) that we deal with. Bubba was a rabbit that was originally given to a lady when she was looking for a companion for her young Holland Lop doe, Ashley. He was originally a Petland bunny and had a number of health problems such as growths, malocclusion and he was also deaf. He was, however, a rather outgoing and bossy rabbit. When his new home needed to get rid of him due to allergies, he came to us for a while before his original owner was contacted and she decided that she would rather have him back instead of having him bounced around. He returned home, leaving Ashley in our care. 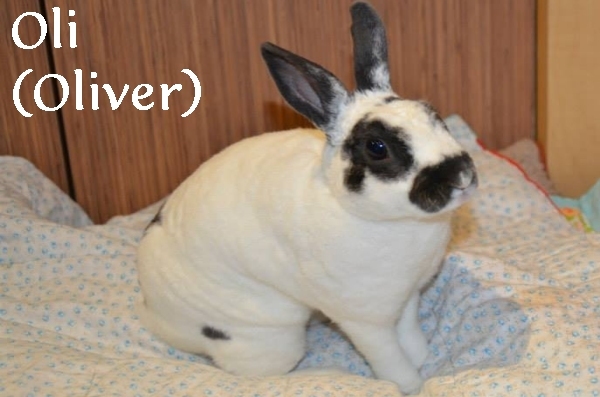 Buttercup was a surrender from a former rabbit hopping club member who was no longer allowed to attend. She and another member had been allowing their rabbits to breed, resulting in Buttercup in their last litter. When the family decided that they no longer wanted the rabbits "destroying their yard", they built a small enclosure for the three rabbits out back and fed them fruit and dog food only, resulting in them becoming extremely overweight and unhealthy. Finally, the parents posted on Facebook that they were planning on donating the rabbits to a local petting zoo. One of us were still friends with her on Facebook and saw the posting, in which we immediately volunteered to take the three rabbits in. Of the three, Buttercup was the most fearful and timid, although luckily not aggressive but not particularly adoptable either. We rehomed Thumper and Skittles separately and Buttercup became a permanent resident in our home. Kokomo has been bounced around an unbelievable amount. We were approached by a woman who loved Kokomo, but was getting married and having a baby. She therefore believed that Kokomo would no longer be getting the attention and care that she rightly deserved, so she decided to surrender her. Kokomo had been adopted by them from the Calgary Humane Society. She was a surrender from a family that had kept her in a backyard hutch and bred her. She was surrendered pregnant and gave birth in the Society, where she had 7 healthy little babies. They were all rehomed separately. When we received Kokomo, she was obese and required quite some time to slim down. She was adopted out to two separate homes, both times being returned for problems with aggression and drawing blood on members of the new family. While we have noted that Kokomo is quite territorial and requires special handling, she is by no means aggressive, simply protective of her space and things. As she does seem to like us so much, we decided that Kokomo would become a permanent resident here, rather than have her bounced around repeatedly with new people. Spyro is a rescue from the same lady that surrendered Ashton and Wallaby, and he was picked up at the same time as Ashton. Spyro is a very playful rabbit that would rather be chasing you around then being cuddled. You need to watch your feet while he's out as he is constantly underfoot and amusing himself by weaving between your walking feet. He adores people. While he does not go to agility often, he loves the exercise and excels at it! He loves being occupied and doing things rather than relaxing. He does have a large number of health problems, ranging from terrible back teeth, pastuerella respiratory infections, bordetella and trouble keeping weight on. Due to this, he is a permanent resident with us. He requires ongoing medications and herbs, as well as someone to make sure that his teeth stay in check and he does not develop abscesses. Ty was presumably an Easter bunny purchase to an irresponsible family. He was kept around for some time until they decided he was no longer wanted. They contacted a rabbit breeder in Edmonton and told her that if she did not pick up Ty that night, he would be released in a local park and left there. The breeder picked him up and kept him in her garage for some time on a tarp, which actually wound up dying his feet blue, before we went to Edmonton for an agility demonstration and she offered to give him to us since she had no use for him. One of the agility members decided she wanted to take him but could not keep him in her current apartment, so we decided to keep him at our house until she could come up with proper accommodations. In the end, it turned out that she could not take him at all. We decided to try adopting him out to some other people, but that home did not work out either. In the end, we were so charmed by his personality, we decided to make him a permanent resident in our home. Kia is a very beautiful bunny that is full of personality and energy. She is also very sweet but is quite timid with new people and situations. She does love grooming people though. She became very attached to us while we were raising her and her siblings, so we decided she would be a permanent resident with us. Tiana is a very loving and curious bunny who loves head rubs. She is bursting with personality and grew very attached to us while we were raising her. Due to this, we have decided that Tiana would become a permanent resident. Wallaby was a rescue from the same lady who surrendered Spyro and Ashton. He had been kept in a wire, outdoor cage during the winter and somehow managed to tip over his water dish, in doing so wound up freezing the bottom of his feet and his ears to his cage. Luckily, he made a wonderful recovery, but still has thick scar tissue on his ears. Wallaby is an extremely happy and affectionate rabbit that loves people, as well as agility. He is very cuddly and appreciates living indoors. He is one of the rabbits that we have decided to make a permanent resident and will be staying with us. Skittles was a surrender from a former rabbit hopping club member who was no longer allowed to attend. She and another member had been allowing their rabbits to breed, resulting in them being not allowed in the club any longer. Buttercup, Thumper and Skittles were all surrendered at the same time. For years the three rabbits had free roam of the back yard and commonly escaped, often found wandering the neighborhood. During the summer they survived off of grass and fruit, while in the winter they lived off of an abundance of fruit and Beneful dog food. The parents became tired of the animals and posted on Facebook that they were planning on donating the rabbits to a local petting zoo. One of us were still friends with her on Facebook and saw the posting, in which we immediately volunteered to take the three rabbits in. Skittles was a very mellow and laid back little rabbit who was adopted to a woman that loved her very much and bonded her with a lop named Liz. Unfortunately, she passed away a few years later, no doubt from accumulation of health problems this lifestyle caused. Jimmy was a surrender from a breeder who could not rehome him. He was a very sweet and calm bunny who loved people. He was rehomed very quickly to a previous member of the rabbit hopping club. Unfortunately, Jimmy did not have a very long lifespan as a number of health problems came up about a year into his life and he passed away with his family. Munchkin was a rabbit that was with us for only a very short time before she was adopted. Someone who was a friend of a friend had been looking for a rabbit and adopted Munchkin after only a short time of having her. She was surrendered with Jimmy from a breeder. She was on the timid side but very sweet. She had very pretty red eyes and given time, would be a very good pet for her new family. Midget is an adorable Holland Lop that needed transportation from Edmonton to Calgary for a family that was going to take her from another group with Fidget. When we dropped them off, we had the suspicion that they would be another family that would be dumping the rabbit after a few months. They seemed unsure of the bunnies and did not even want to hold them. However, we did our best to educate them on proper rabbit care and hoped for the best since they had gone through someone else and it was not our place to refuse them. They lasted a month before they showed up at a rabbit hopping event, begging for us to take the rabbits. We did, of course, and managed to find another home through the group that had originally had them. Midget was a very sweet and adventurous rabbit who was very fond of people. Fidget was a beautiful black Mini Rex that needed transportation from Edmonton to Calgary for a family that was going to take her from another group. When we dropped them off, we had the suspicion that they would be another family that would be dumping the rabbit after a few months. They seemed unsure of the bunnies and did not even want to hold them. However, we did our best to educate them on proper rabbit care and hoped for the best since they had gone through someone else and it was not our place to refuse them. Kit and Kat were a surrender that came from a neighbor of ours that had two boa constrictors. After feeding his boa's only frozen food for the time he had them, he decided to try feeding them live. He ordered two two-week old baby New Zealand rabbits and put them in the cage with his snake with access to water, but no access to food. His snakes had no interest in the rabbits, so he approached us one day about them. We agreed to take them and found out the rabbits had been in with the snake for an entire week. How they survived for so long with no appropriate food is nothing short of a miracle. When we went to pick them up, Kat was actually sitting directly on the snakes head. When we brought them back, they eagerly ate and grew at a nearly alarming rate. They did suffer from an upper respiratory infection, which was treated successfully by our vet. They were both unbelievably sweet and social after all they had gone through in their short lives. They were both rehomed. When we brought them back, they eagerly ate and grew at a nearly alarming rate. They did suffer from an upper respiratory infection, which was treated successfully by our vet. They were both unbelievably sweet and social after all they had gone through in their short lives. Oreo was a very unique case indeed! Oreo was seen by my Dad while he was leaving the house to go to work. He had been darting through the street and hiding under cars. I immediately went outside with a butterfly net and after an hour of trying to catch him, needed to head back inside to head to school. We saw him again when I got home and went out to catch him, only to leave empty handed when it ran back into a yard that we could not access. It was not until the next day that we managed to catch Oreo, only to discover from someone that he belonged to a neighbor that wanted him back. We hesitantly placed him back in the yard. We watched him from then on, knowing that the family would not give him up and that other then when he escaped, they were breaking no laws. We spent a fair bit of time chasing him back into his yard out of the street to ensure that he would not be run over. We often saw him sitting on the deck in the rain, a heart wrenching site. Finally, one day he would not go back to the yard so we caught him once more in the butterfly net, only to have his "family" come out and finally decide to give him to us. We were overjoyed and immediately brought him inside to start his life as a house bunny. We got him healthy and happy before rehoming him. Sparta was a surrender that was brought to us by a woman that claimed her friend had found him running loose around Calgary. The friend kept him for a while, but realized that a rabbit was more work then she thought and gave him to the lady that gave him to us. She kept him for a while as well in a dog crate in her back yard, leaving him as entertainment for her young son. When her husband notified her that he was coming back from Iraq, she decided to get rid of Sparta as her husband did not approve of pets. Sparta had severe dental problems, a dislocated shoulder and his quality of life was deteriorating. After a few weeks of attempting treatment and trying to find a solution, the decision was made to have Sparta humanely euthanized. Roxy came from an elderly man who received Roxy when he agreed to baby sit her for two weeks for someone and they never came back for her. The man kept her for 2 years, allowing her to be free roam around his apartment although his family made him get rid of her when she started ruining his apartment. She was in very poor shape when she came in with extremely overgrown nails and was very skinny, although we later realized that a big reason she was so skinny was due to cancer. She had developed cancer through her abdomen and chest cavity and while we tried to get her up to a proper weight so she could be operated on, she passed away in her foster home. Although it was very sad and we wish there was more we could have done for her, we are glad that she was able to experience love and happiness in her foster home with people who cared about her. We were driving home and a baby appears right by the road. We decide to pull off and see if we could get it, since it seemed to be young enough to have been an Easter baby, which might mean it was recently left there and easy to catch, but unfortunately it got under someone's deck and we couldn't to get it. We came back and Mom was talking about a cute black rabbit that came over and actually nose bonked her hand, but he got chased off by a brown rabbit that came at him from down the street. They got entangled in the road and were running towards busy traffic so Mom tried herding them towards a safer place. By the time we got back the brown rabbit had run off and the black rabbit was now grazing on a lawn with a doe. Originally we were going to try and catch the doe then, she looked awful with missing hair and an open wound, but she wouldn't let us near her. Little black guy was still hanging around though and he led us on a bit of a merry chase, nose bonking our hands before spraying and bouncing off, seemed to be quite amused by it all. I had my one shot and quickly got him by the shoulders. He struggled until I managed to get a football hold on him and we got him in the car as quick as we could. He was understandably confused and stressed, but seemed to settle down surprisingly fast, to the point where he actually flopped on the seat between us and seemed to relax a bit. We had to do some cleaning when we got him home, I was petting him and my hand came away filthy with dirt and motor oil mixed up. He didn't want to poop the first day we had him and we were really concerned because he was eating, drinking and acting perfectly normal, he chowed down on anything that we put in front of him and he was peeing, but there was no poop, until I witnessed him pooping and then eating it as soon as it came out! Not cecotropes, but actual poop. It's suspected to be due to malnutrition. Wazowski was a surrender that came to us from a woman who worked at a pet store and stopped them from euthanizing him. She called us claiming that he was suffering from a light upper respiratory infection and she needed to get rid of him. He was living in a Tupperware container and she only had enough food to last him one more night, otherwise he would starve. She had no more money for food. When we brought him home, we realized that he was severely splay legged in both legs in the front end and his respiratory infection was more serious than originally stated. He was extremely thirsty and we believe it was because he only had access to a water bottle, which was raised too high for him to drink from. He could not even eat out of a food dish, so we placed his food on the floor where he could reach it. His respiratory problem was more severe then what we were told, he continually sneezed up thick, white mucous. When we awoke the next morning, he was covered in mucous on the top of his head, ears, nose and feet from attempting to clean it and only spread it. We discovered he was also grinding his teeth from pain. He went into the vet and everything we thought was confirmed, as well as him having a high fever from infection and he was also suffering from a dislocated shoulder. We got a second opinion from another clinic and after thinking over his quality of life, we decided to have him humanely euthanized. Meet Sarah, a beautiful and friendly girl who came in to the rescue in rough shape. Sarah was found by a family in a park where she had been recently dumped. They kept her for a few days until they decided on what to do with her, deciding to try contacting us. We were full at the time and offered to come take some photos of her to see if we could get any interest, but when we saw he condition we knew we had to take her in. She was missing hair under both eyes due to her eyes running and matting up the fur beneath them, causing it to fall out. Now that her foster keeps on top of keeping her eyes clean, she has been able to grow most of it back in. Her teeth were very misaligned, causing them to grow sideways out of her mouth and it makes it difficult for her to eat. Whoever had her previously allowed them to grow quite long and made it extremely hard for her to eat anything and because of this, she was thin. She went in to the vet every two weeks for a tooth trim. Her toes were oddly floppy, whether from injury to them or a genetic disorder we are unsure, but it causes them to look a bit strange. Despite all the obvious neglect that she has endured, she was very outgoing and very social with people, although a little unsure of new things. She was doing very well under our care and she was getting the proper care she needed for the rest of her life through AAORR. After doing all we could, we had to have Sarah humanely eithanized on August 26, 2015. She was loved by many, especially her foster mom. She will be missed, but never forgotten. Meet Clementine, a young Holland Lop with a dislocated back leg.